NEW SIZE FOR A NEW YEAR Welcome to your new Back Pages magazine. Following your feedback in the last issue’s survey, we have decided to produce smaller, but more regular magazines. This will enable you to hear from us more frequently and, we hope, be encouraged by how God is at work in the world of sport. 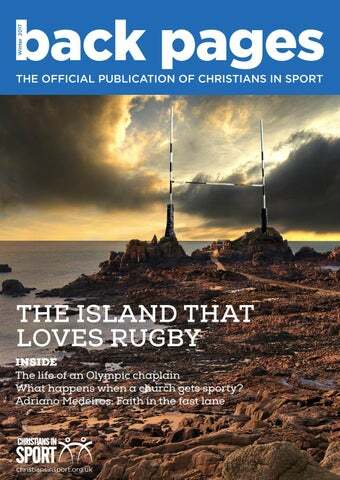 This issue see us look at the island of Jersey and its passion for rugby, what an Olympic chaplain gets up to in the village and a riveting interview with a motor sport star. Our Mission To reach the world of sport for Christ. Our Vision Christians everywhere living out their faith in sports clubs and teams. Churches everywhere engaging with their local sports communities. Sportspeople everywhere having the opportunity to hear the good news of Jesus. ACTS Community Church in Wales’ Rhondda Valley used the Sports Mission Pack to run a ‘Fit Always’ event for their local fitness community. Around 90 people, including 40-50 guests, played rounds of the Sports Quiz, took on fitness challenges and heard testimonies from an Ironman triathlete in her 60s and two ultramarathon runners. Church member James Piper runs fitness classes in their building seven days a week and this event built on that base. Please pray that many members of this fitness community will be drawn into church through the event and the invites of others in the class. They are planning an Alpha course in January. THE ISLAND THAT LOVES RUGBY Jack Newton is already in his element sharing life and the gospel with the people of sports-mad Jersey. Despite a population of just 100,000, Jersey has 167 sports clubs ranging from angling to water polo. And playing in front of crowds approaching 2,000 in the Championship, English rugby union’s second tier, Jersey RFC are the biggest local sporting success story. Since September, rugby player Jack Newton has been based on the Channel Island as our regional Intern. And for a self-confessed city boy, he is relishing being an islander on sports-mad Jersey. This was a big change for Jack, but he wanted to see where God might lead him. “It was a big commitment, living away from friends and family, but I love it. I love the opportunity to go somewhere new. I used to live in Australia and I have lived in London – it’s always been big cities. The chance to live in a small community really appealed to me. There was so much about Jersey that was attractive and seeing how sporty the place is was great.” Jack is working alongside Nick Ferraby, our Jersey Co-ordinator, with a particular focus on reaching out to the rugby club He is currently playing at centre for Jersey Athletic, the club’s second team, and is a member of Town Church in St Helier, where he is serving as part of the church community while also receiving theological training. The Internship is an 11-month training programme for those of graduate-age who are passionate about understanding the Bible better, passionate about sharing Jesus in the world of sport and are willing to be challenged and shaped as they both learn and serve together. The 2017-18 Internship will provide opportunities in mission, events and operations, media and marketing. For more information, visit christiansinsport.org.uk/internship how God has provided for me out here. The generosity of the local church in providing me with accommodation and transport has been a huge blessing and one I’m so thankful for. Everyone has been so welcoming.” Jack has some big prayers for Jersey. community in Jersey, rugby is right at the forefront of that. “I’m here to serve the rugby community. Whether that is coaching kids or encouraging my teammates.” Jack added: “Playing for the second team is fantastic for me as it is full of Jerseyborn players. These are the guys who have got the club to where it is over the years.” Moving to a new place to start a new job has prompted Jack to trust in God more, with many encouragements. environment for all the young people to progress in their sporting ability. Team Challenge once again proved to be a real highlight with young people pushing themselves in a range of competitive games. We were ever mindful of God’s goodness and grace in providing a brilliant team of leaders and coaches committed to bringing the good news of Jesus to bear on the lives of young people in an irresistible environment of competition and care. Performance Team member Jules Wilkinson was one of three international Protestant chaplains at the Rio 2016 Olympics. Here Jules reflects on her role. I didn’t really know what to expect before going to the Games, but it was a real privilege to serve God out there and to meet lots of the athletes and staff who made Rio 2016 happen. available as and when needed to fit in with the athletes’ schedules. The whole Games was a great reminder of God’s sovereignty. For example, while I waited to meet people, He gave me opportunities to chat with others I could never have planned. It was a great chance to rely on God. Particularly on my busier days, I often had no alternative! I never thought I would need media training to prepare for Rio, but having been interviewed on the radio a fair few times, I gradually got more used to it. However, sharing God’s word with athletes remained my focus. One Bible passage we looked at was Philippians 4 v 4-7. We considered how the fact that the Lord is near helps us to always rejoice, always be gentle and not to worry – all vital qualities in the Olympic Village. Pray Pray that Jules and the rest of the Performance Team would have increasing opportunities to encourage elite sportspeople who are Christians and share the gospel with those who don’t yet know Jesus. We all know that sport involves sacrifice. No one achieves their potential through talent alone. From early morning runs in the dark to training sessions in the bitter cold, making tough choices are all part of being a sportsperson. And this is true in every area of life. If you want to get something done, there is always a cost. We’re passionate about helping Christians integrate sport and faith as well as enabling sportspeople to explore the gospel message. Forty years ago the work started with a handful of Christians and we are thankful to God for the journey so far. We’re excited about the future given that 10 million people play sport every week in 150,000 clubs and teams across the UK. Will you prayerfully consider partnering with us financially to support this growing work? In 2016, we based staff in six parts of the UK with, God willing, six more cities to follow in 2017 and another six in 2018. Our longing is to see more sportspeople respond to the gospel. Being more locally based means we can work with more churches to help Christians live out their faith in their sports clubs and teams. Clearly though, to do that, there is a cost – just as there is with any gospel work. Christians in Sport General Director Graham Daniels said: “We are very thankful to God that thousands of Christians are involved in sport and last year tens of thousands of sportspeople attended guest events explaining the Christian message. “Sport continues to be massive in our culture and we long to see the work grow further so that the impact becomes more and more locally felt.” Regular financial giving is one of the best ways to support Christians in Sport. 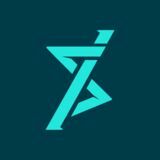 It allows us to plan effectively, provide continuous support, commit to longterm projects and most importantly, build strong, lasting relationships with individuals and communities across the world of sport. MY SPORTING LIFE It’s always great to hear stories of how people are representing Jesus in their world of sport. Whether you are a player, coach or official – or involved in sport in a different way, this new ‘My Sporting Life’ feature is designed to encourage you in your faith as you read of others looking to share the gospel where God has placed them. 200m, but we didn’t have a hurdler for this particular meet so I was put in for 110m hurdles. In front of quite a big crowd from both schools, I proceeded to hit every single one of the 11 hurdles, knocking over nine, falling twice and managing to snap two of the hurdles. I had nowhere to hide! What encouragements have you seen as a Christian in your sport? It has been great to see guys from the team taking an interest in Christ, coming along to church and asking questions. What do you find tough about living as a Christian in your sport? The balance between getting involved with your team, buying in and building friendships whilst not compromising on God’s pattern for life – wanting a shared experience and trying to honour God. How do you look to share the gospel in your team? I ask teammates what they think about Jesus – if they have any background of faith. I then ask if they’re interested in finding out more or have any questions and would be up for coming to church or reading the Bible with me. What one piece of advice would you give to Christian sportspeople to help them share their faith? Most people are very happy to talk about their personal faith or an absence of one, and I’ve found that’s the easiest way to then be able to share your own. WHAT HAPPENS WHEN A CHURCH GETS SPORTY? Jo, who previously studied French and German, is now looking to mobilise fellow sportspeople in her church and across Stockton. Having sparked interest about Christians in Sport in her home group, she learned there was also a football coach and a PE teacher in the church family. Jo then met with her pastor Andrew Waugh. She said: “I had organised a Dialogue Dinner for my teammates where Debbie Flood spoke and so I was able to explain the vision of Christians in Sport to Andrew through what was happening in my team. They were really interested in the gospel, which I am very thankful for.” Andrew backed Jo’s plan and is giving her a slot at church in mid-January where she will show the ‘Let’s go’ video and encourage members to meet up, pray and and think about reaching sportspeople in their part of the country. Adriano Medeiros got far more than he bargained for when he sought career advice from an exFormula 1 driver. Hoping to boost his dreams of making it in the world of motor racing, the Brazilian instead began a journey of faith that is still shaping his exploits on the track today. Adriano thought Alex Dias Ribeiro might point him in the right direction to drive professionally overseas, but was told “I can help you meet Jesus Christ”. “The fact that I heard two former F1 drivers talking about God opened my ears. I listened and gave consideration to what they were saying.” Ribeiro was renowned for having ‘Jesus saves’ displayed on his car during his F1 races in the late 1970s. His meeting with Adriano prompted the younger man to look into this Jesus in the Bible and put his trust in Him. Now, some 20 years later, 44-year-old Adriano is himself racing with his own ‘Jesus Saves’ team in the UK in the Classic Formula Ford Championship, which he won in 2013 and 2016. Having grown up as a motor racing mad youngster near the Interlagos track in Sao Paolo, he is now looking to use the sporting gifts he has been given to make Jesus known. school, they would close the gates and not let me go in. What I used to do was get the bus a little bit late, say ‘I’m not going to make it’ then get off the bus at Interlagos and go and watch the cars!” Although raising finances was very difficult, by his 20s, Adriano was managing to compete in a few races. But a lack of money meant he had to be his own mechanic. Adriano’s attraction to the Interlagos track in Sao Paolo began at a young age and he was soon finding crafty ways to see the action. Adriano was optimistic when he was invited to meet ex-Formula 1 driver Alex Dias Ribeiro at Interlagos, but he didn’t know much about Ribeiro’s faith. To his surprise, he also met Emerson Fittipaldi, another fellow Brazilian and a double Formula 1 world champion. wanted to talk to them about my desire to be a racing driver. From here, he worked his way up the ranks. Now the Jesus Saves team also gives Adriano many opportunities to share his faith, which he is keen to do. “The fact that I heard two former F1 drivers talking about God opened my ears. I listened and gave consideration to what they were saying.” Adriano asked Ribeiro if he could help him go abroad and progress his driving career, but was told about Jesus instead. Adriano returned to the Bible study the next week and a couple of months later, he gave his life to Christ at one of the meetings. In 2002, Adriano decided to leave Brazil to pursue his racing driver hopes. His journey took him to the UK and after working as a mechanic and in McDonald’s, he began racing in 2006. Pray As Adriano flies the flag for Christ in the Classic Formula Ford Championship, why not pray that God may raise up others like him across the world of motorsport? Formed in 1980, Christians in Sport has more than 35 years of experience supporting Christians in the world of sport and helping sportspeople explore the Christian message. For more information on who we are and how we can help you, please get in touch using the details below.